Editor's note: An earlier version of this story misstated GM's European losses in 2013. 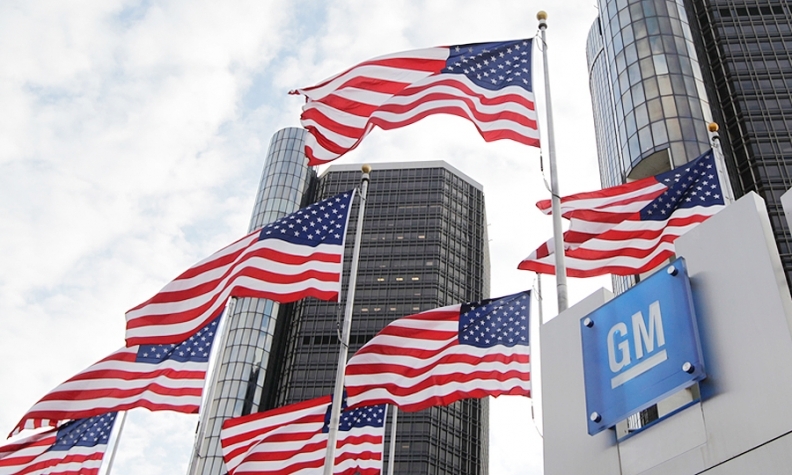 DETROIT -- General Motors said its fourth-quarter pretax profit rose 27 percent to $2.41 billion, its best fourth-quarter result since the 2009 bankruptcy, thanks to stronger pricing across its major markets and stout pickup and SUV sales in North America. The pretax number, which the company believes best reflects its underlying performance, excluded about $900 million in special charges, mostly related to the redemption of outstanding preferred shares. Including those charges, fourth-quarter net income rose 21 percent to $1.11 billion. "A strong fourth quarter helped us deliver very good core operating results in 2014 despite significant challenges we and the industry faced," GM CEO Mary Barra said in a statement. Revenue slipped 2.1 percent, to $39.62 billion. For the full year, GM's net income dropped 26 percent, to $2.8 billion, hurt by about $2.8 billion in expenses related to 84 safety recalls covering about 30 million vehicles. Its adjusted pretax profit fell 24 percent, to $6.49 billion. GM said it would pay 48,400 U.S. hourly employees a bonus of up to $9,000 for 2014, depending on their number of hours worked. The payment is a combination of profit sharing and a performance award, a GM spokeswoman said. GM also said it plans to increase its second-quarter common-stock dividend by 20 percent, to 36 cents per share. Its board of directors will vote on the increase sometime in the second quarter. The move "reflects our confidence in the business and our commitment to increasing return of capital to shareholders," CFO Chuck Stevens told reporters at GM's headquarters today. GM’s results surpassed Wall Street analysts’ expectations. Shares rose 5.4 percent to close the day at $35.83. The fourth-quarter results were driven by North America, where pretax profits surged 17 percent to $2.21 billion. GM attributed the increase almost entirely to a richer mix of pickup and SUV sales. GM boosted its U.S. market share in trucks during the quarter to 24.9 percent, from 23.1 percent. In China, pretax profit rose 37 percent, to $516 million, helped by stronger pricing and higher sales. Stevens said he expects industry sales in China to grow 6 percent to 8 percent in 2015. The rest of GM's International Operations -- including India, Korea, Australia and other Asian markets -- lost about $100 million, an improvement of about $100 million from a year earlier. GM's losses in Europe widened slightly, to $393 million, from $365 million in the fourth quarter of 2013. Stevens attributed the losses mostly to trouble in Russia, where a weaker ruble has made it more difficult for consumers to afford new vehicles, crippling sales. "As we go through 2015, Russia will continue to be a headwind," Stephens said. "But we've taken and will continue to take aggressive action to mitigate those issues." GM has laid off workers, plans to shut down its St. Petersburg assembly plant for nearly two months and made pricing adjustments to offset the current devaluation. GM's losses in Europe for the year widened to $1.37 billion, from $899 million in 2013. Stevens reiterated GM's goal of returning its European operations to a pretax profit in 2016. Fourth-quarter profit improved in South America to $89 million, from $27 million a year earlier, helped by stronger pricing from new vehicles. GM also resumed production in Venezuela in the fourth quarter, which helped results, Stevens said. Fourth-quarter pretax profit from GM Financial slid to $119 million, from $225 million a year earlier, as the company invested more to expand the captive finance arm. GM boosted its pretax profit margin in North America to 8.7 percent, from 7.5 percent a year earlier, its sixth straight quarter of year-over-year margin improvement. GM has targeted 10 percent margins for the region in 2016.